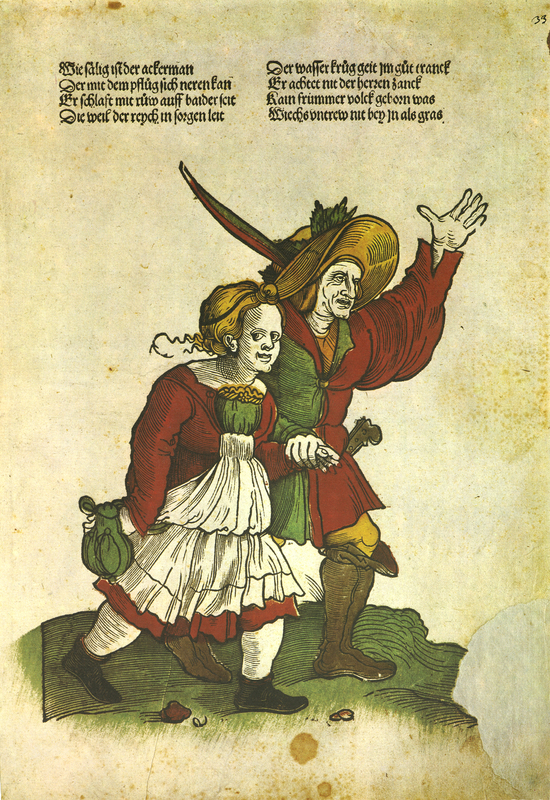 This colourful woodcut by Weiditz portrays a peasant couple off to the dance, carefree and without any woes. The text reiterates this, contrast the full-bellied peasant with the rich man, whose life is dogged by anxiety and conflict. The Peasants’ War four years later would give a lie to this idealisation. Hans Weiditz, “‘Zum Tanz eilendes Bauernpaar’, [Augsburg], 1521. Facsimile from Flugblatter der Reformation und des Bauernfrieges,” ourheritage.ac.nz | OUR Heritage, accessed April 24, 2019, http://ourheritage.ac.nz/items/show/10392.